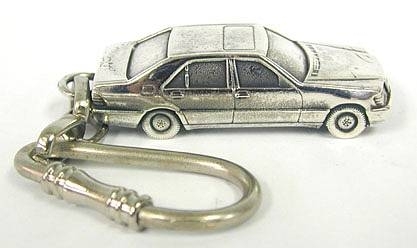 Mercedes Keyring A dashing artisan 925 sterling silver (NOT silver plated) car key chain. Highly sought after by collectors this beautiful key chain in shaped as a highly detailed Mercedes Benz. This item was made in the electroforming method. Measurements: Length: 15mm. / 0.591in. Width: 60mm. / 2.36in. Weight: 33gr. / 1.061oz. Marks: 925 for sterling silver.